Samsung is supposedly launching a new smartphone that is rumored to have a foldable display. The leak came in from the ongoing MWC 2017 where Samsung Samsung shared a teaser at the end of the press conference on Sunday, inviting customers to ‘unbox their phones, ‘ an apparent reference to handset’s super-slim bezels. Samsung has officially trademarked the Galaxy X. The rumor also suggested the unveiling of two new handsets that would be released under the same brand, the SM-X9000 Galaxy X1 and the SM-X9050 X1+. With this in mind, it appears that the Galaxy X would be released with two configurations – a basic model and a larger, phablet-sized variant. 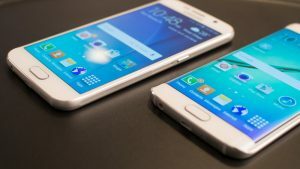 Samsung might equip the revolutionary device with a Qualcomm Snapdragon 835 SoC or a home-grown Exynos 8995 processor. These processors would also likely be paired with ample memory, somewhere in the 4GB-6GB RAM range. The camera of the Galaxy X would probably be capable as well, considering Samsung’s reputation for releasing great-quality mobile cameras. Considering that even the tech giant’s midrange devices feature capable sensors, the Galaxy X would most likely be equipped with a formidable camera setup as well. The company has raised a lot of speculations about the date of release of the device, with a lot of rumors hinting towards the launch of the device clashing with the highly anticipated smartphone Galaxy Note 8, sometime around August.